Scorpius is known in Greek mythology for killing the great hunter, Orion, son of Poseidon (Neptune), god of the sea. While there are many stories about Orion and his death, the most common involve a hunting trip with Artemis, queen of the hunt, and her mother, Leto. One such story is that during the trip, Orion bragged that he could kill every beast that walked upon the earth. Upset by this, Gaia, Mother Earth, sent a giant scorpion to kill Orion. 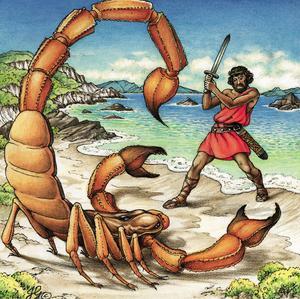 Some versions of the story say that Apollo, brother of Atremis, sent the scorpion. The scorpion rose up out of the earth and fatally stung Orion as he tried to escape. The constellations of Orion and Scorpius were placed on opposite sides of the sky by Zeus to keep them forever apart. Scorpius also appears in one version of the story of Phaeton, the mortal son of	Helios, the sun. Phaeton wondered if Helios, his father, really was the sun. As proof, Helios promised to let Phaeton drive the Chariot of the Sun for a day. As the four great horses that pulled the chariot rose in the east, they went out of control, searing and scorching the earth. Some stories say that Phaeton just could not control them but others say that the horses spooked because they were stung by the giant celestial scorpion. Everything about the energy of Scorpio is intense. It is secretive and distrusting, It is piercing, profound, concentrated, and obsessive. It is driven and zealous. It can be mournful and sullen, moody and morose. It can be jealous and vengeful, possessive and violent. It is also beautiful, passionate, and sexually alluring. The emotions of Scorpio run deep and they are not easily shared. From the rapture of sexual union to the pain of loss that cuts like a knife, these emotions are powerful and compelling. Like a moth to a flame, we find them irresistable. Scorpio is associated with the darkest depths and the highest peaks. It holds the promise of rising from the ashes of devastation, of rebuilding after destruction. It is the experience of death, enlightenment, and rebirth, represented by the scorpion, the eagle, and the phoenix. The deadly sting of the scorpion represents the defense of what exists and retaliation for perceived wrong-doings. The eagle represents leaving this defensive posture behind to soar high above in order to observe the interactions taking place below, without emotional attachment. The phoenix represents the ability to rise up from the ashes of our former selves and achieve the capacity for compassion. Scorpius is one of the brightest and most recognizable constellations in the sky. The brightest stars form a branched asterism that depicts the body of the scorpion. 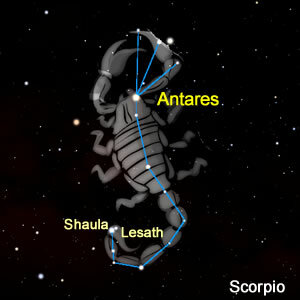 At the Heart of the Scorpion lies Antares, a red binary supergiant. The Greeks thought it looked very much like the planet Mars, thus its name means 'rival of Mars' in Greek. Most of the bright stars in Scorpius are massive members of the nearest OB Association to our sun: Scoprius-Centaurus. It is a loose grouping of hundreds of stars that are not bound together by gravity but are still moving together. Scorpius also contains several sets of double stars. The blue and yellow colors of Omega Scorpii, located at the topmost tip of the scorpion's body, can be seen without a telescope. Two bright stars at the end of the scorpion's tail, Shaula and Lesath, can also be seen and are sometimes called the Cat's Eyes. Within this constellation is also a variable star, which slowly changes its level of brightness throughout the year. There are also several deep sky objects, faint images outside our solar system. These include the open clusters M6 (the Butterfly Cluster) and M7 (the Ptolemy Cluster) as well as the globular clusters M4 and M80. The constellation of Scorpius was at one time even larger than it is today. Once considered to be the claws of Scorpio, the stars of "Chelae Scorpionis" were formally separated and designated as the constellation, Libra, by the Romans. Scorpius is the Latin word for scorpion. Scorpius the Scorpion, can be seen in summer from the Northern Hemisphere close to the horizon. It is best seen from the Southern Hemisphere or southern US where it passes high in the sky.